The colonial house at 26 Mayflower Parkway has all the amenities of a five-star resort. WESTPORT — Some people consider Labor Day weekend the unofficial end of the summer season. Those people clearly don’t live in the Compo Beach area of Westport and they don’t have the ultimate pleasure of living on the uber-chic property at 26 Mayflower Parkway, which has all the amenities of a five-star resort. 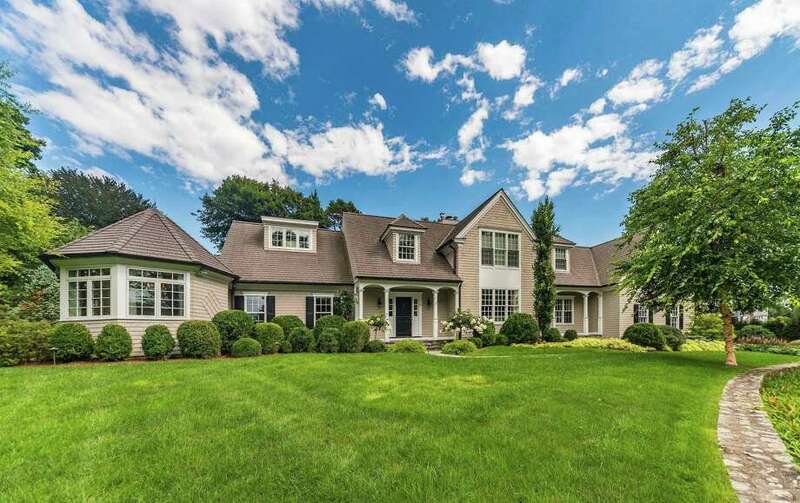 The property of just about one acre features a pale gray Energy Star-rated colonial house with amenities that elevate 21st century living and entertaining to an art form. Inside, the newly finished basement offers a wine cellar, media room, wet bar, and bathroom. And that’s just the basement. In the backyard there is an infinity edge in-ground swimming pool, spa, waterfall feature, a built-in outdoor kitchen, and outdoor stone fireplace. The expansive bluestone patio features open and covered areas and can accommodate grand scale entertaining and intimate dining. Despite the name of the street and the home’s convenient location - it is within a comfortable walking distance to Longshore Country Club and Compo Beach, this is not a busy roadway. It is a quiet enclave, sort of a large cul-de-sac comprising three streets of residential properties. This house was built in 1991. A white picket fence borders the front of this property and its gates open to the long driveway lined with a wide border of granite paving stones to a sizable parking area and the attached three-car, under house garage. A winding bluestone path leads to the covered front entrance. That door opens to reveal 6,100 square feet of elegant and comfortable spaces, beautiful architectural details throughout including custom millwork and molding, and an open floor plan. A Crestron smart home system allows the homeowner to control everything remotely from a smartphone. The details go from the subtle inlaid pattern in the floor of the two-story foyer and in the floors of the formal living and dining rooms to the high-end decorative wallpaper in the dining room. The living room also features a marble fireplace flanked by built-in display shelves and cabinets and a coffered ceiling. In the gourmet kitchen there is a built-in hutch with glass-front cabinetry and an open dish rack, ogee-edged counters, a breakfast bar, a built-in desk area and high-end appliances including a Thermador Professional six-burner range top. Behind the range top is a decorative tile backsplash. The kitchen opens to a sitting area with a vaulted ceiling and hand-hewn exposed beams as well as a casual dining area and the great room. The latter features a floor-to-ceiling red brick fireplace, skylights, French doors to the patio, pool and yard, and access to the mudroom. The eat-in area also has French doors to the outdoors. Even with all the attractive amenities in the backyard the owners of this house may find it difficult to leave the spacious master suite. This suite features a vaulted ceiling with visually appealing paint detailing, a large octagonal dressing room, walk-in closet, French doors to the yard, and a boutique hotel-like marble bath. On the second floor there are four generously sized bedrooms. One of the children’s bedrooms has built-in book shelving and a large loft play area. Another bedroom has sliding doors to a balcony. From the main living level there is a staircase to a large, flexible-use space. It features a wet bar. In the basement the wet bar features a farm sink and refrigerator drawers. The media room has a gas-fueled stone fireplace, and the wine cellar is large enough to also serve as a tasting room. For more information or to set up an appointment to see the house, contact Hyleri Katzenberg of Higgins Group Bedford Square at 203-246-8395 or hyleri@aol.com.